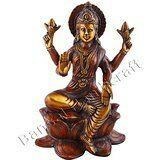 A Beautiful Large Staue of Goddess Lakshmi.This is a beautifully crafted product which compliments your Home D cor. Measures about 10 Inches Height - Certified Quality - Heavy 4 KG weight, Made of Brass Metal. Christmas Gift, Spritual Lucky Gift, Thanksgiving Gift, Fengshui Gift, Wedding Gift, Birthday Gift, Anniversary Gift, Valentine Gift.